Okay - this is probably going to be my most bizarre blog post ever. 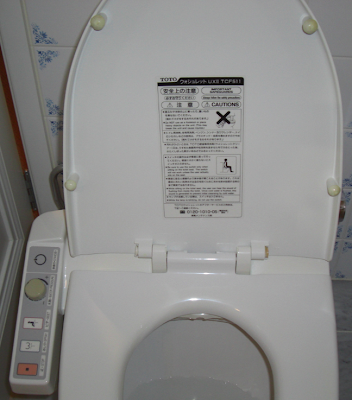 Since arriving in Tokyo, I have been completely bewildered by the toilets in the hotel and conference centre. They are connected to electricity and have all sorts of weird warning and caution labels all over them. Is it just me or does running electricity into a toilet seem like a bit of a dangerous idea? Mine has no less than 5 buttons and a complete array of instructions and cautions. Since they are all written in a combination of Katakana, Hirigana and Kanji, I have no idea what they mean. I was scared! I have been very careful not to touch any of the buttons for fear of receiving ice cold water up the backside. Take a closer look at the controls. Does any of this look enjoyable? Does the middle one imply that the water pressure can be so high it can literally lift you into the air by aiming pressurized water up the rear? The woman in the graphic looks like she is balanced on a fountain of toilet water. I was wondering if you hit the stop button you just free fall back to the seat all of a sudden or if it just gently lets you back down? Building a robotic toilet just seems like a bad idea. ROTFL!! I love Japan!!! Got to Japan. About to give a talk on Adobe SOA in the Enterprise (mainly focusing on LiveCycle, Flex, ColdFusion etc.) and then I'm doing the sneak peaks on server-side ActionScript. I love this country. 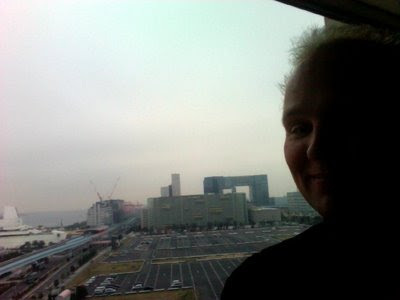 We are in the Daiba district. Wish I had brought my video camera for filming an episode of Duane's World. Tomorrow I get to demo Ichabod, the headless Flash player that allows Google to index Flash content and follows links and states. I have it running on an Ubuntu instance on VMWare and have been running some of my own tests. I just figured out a new way to force Google to index Flash content (jump the queue). Anyone want to know? On Monday, January 26, I got to go to Fender to talk to their developers (mostly all musicians themselves). What can I say? This was by far my best ever day as an Adobe Evangelist. 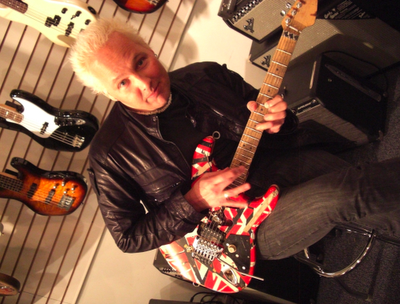 To top the whole thing off, I got to play one of Eddie Van Halen's EVH Frankenstein guitars. All the guys at Fender rock. My job is to go out and listen/preach about technology and work with architects to see how things might fit together, but I rarely get to join both my passions and work with music. As a musician, I have played Fender instruments most of my life. In fact, the only non-Fenders I own (one Jackson and one Hamer Flying V) are now both lines of guitars owned by Fender. To be blunt – I love Fender. My own Fender Frankenstein is my pride and joy (body by Cremer Guitarworks from USA). The Hamer is a rare flying V designed for Michael Schenker. There were a very limited run of them and I was lucky enough to buy one in about 1984 for $2500. To date, it is my favorite studio axe. So what are some good ideas for Fender’s web presence? One idea I strongly believe in is to harness collective intelligence, so I want to pose the question to all the musicians that use my blog. What do you want to see for Fender as a web presence? What is your idea of a perfect user experience with Fender? One idea I think would be cool is to provide a music mix wizard like the one from www.mixmatchmusic.com. This would allow any Fender owner to post their tracks and mBits © to the MixMatchMusic site and allow people to remix, add vocals etc. This would be cool. 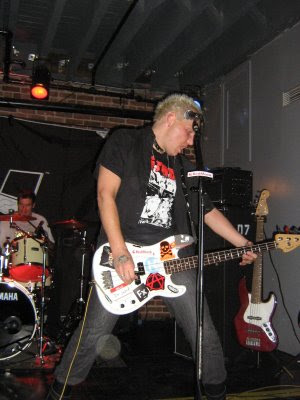 But not as cool as the honor of getting to play a real American made Fender Pre bass live on Stage with my bands 22nd Century and Stress Factor 9. I came across this ridiculous blog post complaining about SOA standards initiatives and implying that all of us who worked on standards (well over 1000 people) have failed. This article has been curiously categorized under "Men's Health," which leads me to believe the ill-informed author is doing nothing more than trying to make some ad revenue. Since the author decided not to reveal his or her identity, allow comments, or factually state matters related to SOA and provide a complete story, I decided to comment on it here. 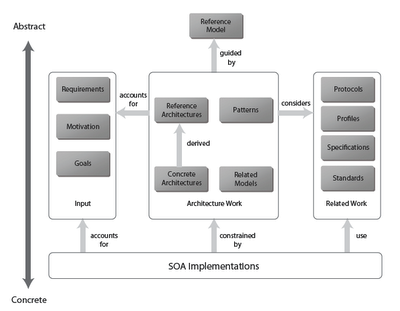 First - the article itself is obviously short of one effort - the Open Group's SOA Reference Architecture. This really means we have 4 standards and figuring out how to use them and how they fit together can be daunting to an outsider (I'll concede this point). Here is how they work. The OASIS SOA Reference Model is an abstract model for services. As such, it is a set of guiding principles on what SOA is. It is not the definitive definition of SOA, it is simple a definition. Also - since it is abstract, no one can claim their product is implementing it (if this was possible, it would be concrete rather than abstract). Here is a chart of how software architects generally capture and preserve knowledge. A longer version of this is explained in this SOA White Paper. At the next level down, there are two SOA Reference Models currently being worked on in standards consortia. There are also many others that have been completed. It was always envisioned by the OASIS SOA RM Technical Committee that there would be numerous Reference Architectures based upon the Reference Model. A Reference Architecture is a generic blueprint for a class of items that may be further specialized to meet a specific set of requirements. The Open Group and OASIS both are working on standards based SOA Reference Models and having noted such, are already looking at ways to harmonize and work together (I will be at the Open Group meeting with my (very smart) OG friends Heather Kreger and Chris Harding to discuss this in San Diego in one week's time). In the meantime, Adobe (and a ton of other vendors), the US Justice Department, the European Broadcasting Union and a number of other groups have harmonized around the Reference Model. Its purpose has been to provide a common point of reference about what SOA is, noting the elements that are common in all SOA. If you were to make such a RM for a "House", at this level of abstraction, you would include things like the foundation, the walls, the doors, the roof etc, and define each one, its purpose, and how it interfaces or works with other components or entities. This does not prevent people from designing specific houses to add in other elements (like skylights, tunnels, fireplaces etc. ), but merely gives the industry a point of reference. One of the most valuable things a Reference Model brings us is the ability to note differences in definitions of the thing or class of thing. The other effort mentioned (run by Cory Casanave) is OMG's SoaML. Cori is a good friend of mine and one of the most brilliant minds around. As is usual in OMG activities, the goals of SoaML are to support the activities of service modeling and design and to fit into an overall model-driven development approach. As such, it provides a valuable piece of work to the overall SOA set of standards. One of the most common questions people ask is "How do I identify a candidate for a service?". A model-driven approach (even like OMG's MDA) will help in this respect. Now back to the ill conceived, anonymous spew of hatred and misleading venom. The author has gotten confused on the use of UML. Waaa! Too bad - UML is here to stay and it is an unambiguous and consistent approach to capturing and preserving knowledge (which is why most of the smarter standards groups use it). The 4 standards I have mentioned in this blog post have been participated in or contributed to by at least 1,000 people from most of the top software companies in the world (check out the references on the various documents and websites). So who is right here? Actually no one. Perhaps we (the various standards consortia) have failed to simplify the delivery of SOA to the level of the gradeschool mind. Maybe this is something we need to table for the meeting in San Diego. But I will state with absolute conviction that SOA is not something designed to sell products; it is a valid architectural and business paradigm of matching needs and capabilities via services. It is widely used and services are here to stay in modern computing. I also believe these four standards and others are important pieces of work for our industry to avoid confusion and add clarity. My wife and I are hunting for a new car to replace her now sold Land Rover Discovery. We used AutoTrader.ca, a great site for finding cars after doing all our primary research on new cars at thecarconnection.com. 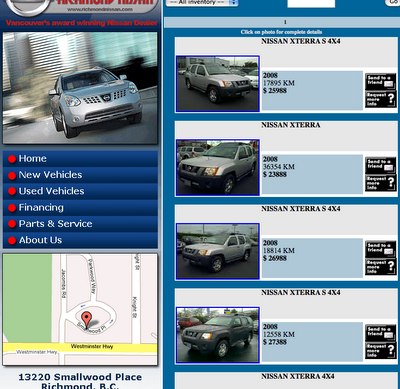 We had settled on the Nissan Xterra as our first choice to investigate and found that Richmond Nissan had 5 Xterras advertised as available for sale (I printed out the paper with vehicle stock numbers and cars available the same day as we went to the dealership). LOL - when we got there, not only were the salesman not able to find them (claimed they only had one left), they immediately mentioned the new model (2009) is on sale. This is after we packed the whole family into the car for a 45 minute drive to the lot. Bait and Switch is an illegal practice in British Columbia and I urge anyone who visits Richmond Nissan to call them first to keep them honest. Dishonest cars dealers are not good for the reputation of the brand nor do they keep customers happy. Even today, they are still advertising 5 Xterras they do not have for sale. (Note - this link will likely not reflect the state of Sunday, January 25, 2009 as time passes so the image is posted below). Luckily, we happened to venture across the street to the Toyota dealership and took a peak at some of the new Toyotas. We decided on the 2009 Toyota RAV4 7 passenger. This car had been on my radar from The Car Connection but we had favored the Xterra as it had an overall rating of 7.8/10 vs 7.6/10. Nevertheless, after seeing both cars, the RAV4 beat the Xterra is several categories. Most important aspects were 7 seats, factory ski/board racks, 37 MPG highway (the costs will pay for itself over the Land Rover in gas savings at $1.28/litre) and drive-ability. The on-demand 4-wheel drive is an important feature too for the trip to Whistler next month.